3. What does the heart look like inside? 5. Why does the heart have two atria and two ventricles? Inhaled air contains oxygen that enters our lungs. We breathe in air with 21 % oxygen and 0.03 % carbon dioxide. We breathe out 16 % oxygen and 4 % carbon dioxide. Below the lungs works a large muscle called the diaphragm. When the muscle tenses (contracts), it pulls the lower part of the chest cavity downward. The lower parts of the lungs are pulled along as well. The chest cavity is enlarged and the lungs as well. Air is flowing into the lungs. The diaphragm is shown in red. Left image: Inhalation. Active process - the muscle is contracting. Right image: Exhalation. Passive process – the muscle is relaxing – is stretched. The trachea divides into two bronchi (air pipes). One bronchus connects to each lung. The bronchus divides itself and at the end of each branch is an alveolus. The oxygen-poor (deoxygenated) blood from the heart (shown blue - dark red in reality) absorbs oxygen from the air. This makes the blood oxygen-rich (oxygenated: shown red - light red in reality). Carbon dioxide from the blood enters the alveolus cavity and is exhaled. The oxygen migrates into the bloodstream from the alveoli because the oxygen pressure is higher in the air and lower in the blood. This pressure difference evens out automatically the best it can. The same principle applies to carbon dioxide, but the pressure difference is the opposite. Small cells in the blood called red blood cells absorb the oxygen. The red blood cells contain a protein called hemoglobin. Hemoglobin makes the blood red. The oxygen-rich blood is pumped further to the heart. What does the heart look like inside? The heart is a muscle that continually pumps blood through blood vessels to all body parts. The heart pumps about 70 beats per minute. We say the pulse is 70. The heart consists of two pumps that pump simultaneously. One pump section consists of the right atrium and right ventricle. The second pump section consists of the left atrium and left ventricle. 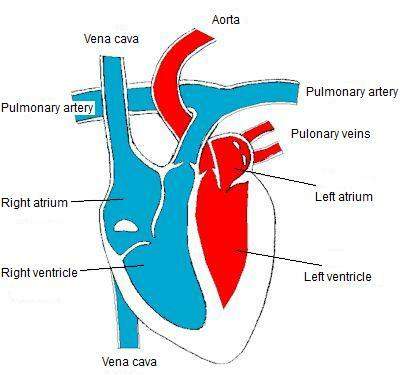 There are valves between each atrium and ventricle but also between the each ventricle and outgoing arteries e.g. the aorta. When the ventricle muscles contract, the blood is pumped out trough the artery. At the same time, the valve between atrium and ventricle closes. These valves allow the blood not to be pumped back into the atria, but only the right direction. In the same way, when the heart is resting between the beats, the blood that just was pumped out through the artery, e.g. aorta, is trying to get back into the ventricle. This is not possible, because of the valves between the aorta and ventricle. These valves prevent blood from flowing back into the ventricle. When the doctor is listening to the heart with a stethoscope, the doctor is hearing beating sounds, da-thump, thump-da, da-thump...etc. It is the valves closing that sound. Try to see everything in front of you. Systemic circulation: Oxygen-rich blood is sent out to the body through the aorta, the body's largest artery, to oxygenate e.g. the brain, liver, kidneys, muscles, i.e. all bodily organs and tissues needing oxygen. After the oxygen is consumed, it pours back to the heart finally through the vena cava. Pulmonary circulation: Oxygenation of the blood. The blood flows to the lungs and back. The oxygen-poor blood is sent from the heart out through the pulmonary arteries. As the blood is oxygenated in the lung alveoli it flows back to the heart through the pulmonary veins. The pulmonary arteries are the only arteries transporting oxygen-poor blood while the pulmonary veins are the only veins carrying oxygen-rich blood. The blue color of the heart shows that the blood is oxygen-poor (blue in the picture - dark red in reality). Oxygen-rich blood is red in the picture – light red in reality. Why does the heart have two atria and two ventricles? To oxygenate the blood but also to rid the blood of carbon dioxide two circulatory systems are created. Oxygenated and deoxygenated bloods are not to be mixed. Therefore, a muscular wall in the heart separates the systemic and pulmonary circulations from each other. The white in the picture above is the actual heart muscle. A muscle can only contract. If you study the heart above you'll see what happens when the heart muscle is contracting. The blood is squeezed out. Arteries: Blood vessels leading out from the heart. This blood is oxygen-rich if it originates from the aorta and oxygen-poor if it originates from the pulmonary arteries. Veins: Blood vessels leading blood back to the heart. This blood is oxygen-poor if it comes from the systemic circulation and oxygen-rich if it comes from the pulmonary circulation. Eg. The blood flows out from the heart to body cells through blood vessels called arteries and back to the heart through blood vessels called veins. Capillary: The blood has to pass between artery and vein. These very thin blood vessels are called capillaries. If stung in the finger, blood can emerge. This blood comes from capillaries. The red blood cells deliver their oxygen in the capillaries. The oxygen travels through the capillary wall and out to the body cells that are oxygenated. Similarly, the carbon dioxide leaves the cells and goes out to the capillaries and entering the red blood cells. The blood is now transporting carbon dioxide back to the heart. All capillaries on the way back to the heart join with more capillaries and these merged blood vessels end up wider. These large collecting blood vessels are called veins. The now oxygenated cells use the oxygen to produce energy. The energy enables the cells to work with their tasks, but also to maintain a body temperature of approx. 37 oC. The energy generating reaction is called the cellular respiration reaction. Carbon dioxide and some water are exhaled. This reaction occurs in the body cells. 1. How does oxygen enter into the body? 2. What is the oxygen used for? 3. When the body has used the oxygen, what does it give in turn to the blood? 4. What is an artery, vein and capillary? 5. How does oxygen travel with the blood? 6. Why is the blood red? 7. How much oxygen does inhaled air contain? 8. How much oxygen does exhaled air contain? 9. How much carbon dioxide does inhaled air contain? 10. How much carbon dioxide does exhaled air contain? 11. What is the large muscle called that allows us to breathe in? How does it work - explain for yourself? 12. What gas exchange occurs in the lungs? Why does it happen? 13. What is the pulse? 14. What is the difference between ventricle and atrium? 15. What is artery and what is vein? 17. How is it possible for the doctor to listen to the heart? 18. What is the main task of the systemic circulation? 19. What is the main task of the pulmonary circulation? 20. A muscle has only one task - which one? 21. How can a muscle get energy? 23. What is vena cava? 24. What is the task of the valves? Describe where and why? 25. Explain the cellular respiration reaction? 26. Extra, search the Internet: How does sugar (glucose) find its way to the cellular respiration reaction?